A Spot of Cha | Would you like one? 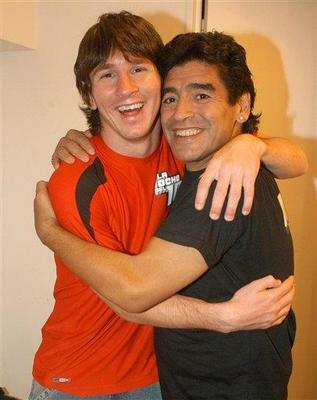 Taken from the Daily Telegraph's picture galleries. Would have taken pictures if I wasn't out of my mind just then. My dealings with British Airways, from start to finish, had all the trappings of the most sensational of Shakespearean tragedy. Emotionally-charged confrontations? Check. Dire circumstances? Check. Carelessly broken promises? Check. Epic, nail-biting quests across oceans in order to reclaim rightful property? Check, check, check. However, the scariest thing of all as that this tangled mess has its basis in cold, hard reality, something that should outrage anyone with the remotest sense of fair play. Dressed in borrowed clothes the next day, I awake to the news that no flights are allowed in or out. Pitiful scenes, just like the one above, fill the screen. My dad and I take the Tube back to Terminal 5 to try our luck. After going through a somewhat drawn out screening, I was allowed to go into the baggage room and check every bag there. It was pandemonium, hundreds of suitcases haphazardly piled on top of the other with barely any rhyme or reason. A lady was floating around amidst the clutter, trying to categorize it with a vague sense of purpose. She too had no answers as to where the luggage from the BA flight from New York yesterday could possibly be. Perhaps they were still unloading from the aircraft? Who knew? It took 20 more frustrating minutes for me to realize that my suitcase was not among the baggage carcasses clogging up the arrival hall. I had to subdue my obsessive inclination to search all day and make a report. We constantly examine the online baggage tracer for our remaining time in London, hoping that the whole affair would resolve itself before we left for Spain in a few days. It was third time lucky, as we finally get some news. Guess where my bag was? Not in Heathrow, not in JFK, in Dublin! As I’d been fool enough to be late for check-in (I fully admit my own culpability tinges the matter ever so slightly), they had to put my baggage on the next available flight to Heathrow. And as the airport had gone into hibernation, no flights could land. All because of a few inches of snow, that had actually stopped accumulating much after the first day! We heard that Heathrow was quite the laughingstock among the Scandinavians, who probably have to deal with blizzards and the like all the time. I hoped like hell that they were bloody ashamed. To top it all of, next to none of the calls we made to them amounted to actual conversations. We were either blankwalled with a tinny answering machine or foisted onto a call centre in India, where they knew even less about my luggage’s fate than I did. By the time someone who sounded like he might actually be in London finally deemed us worthy of a few moments notice, my mother was done with pleasantries. Following a tense, angry exchange, we managed to gather that the flight from Dublin had indeed arrived, but there was no way of knowing (someone should take a shot for each time they say this) whether the baggage was on the plane. Given the endless piles of baggage already at the airport, they were obviously going to take ages to verify this for us. We knew by then that I was going to have to survive two weeks in Spain without any of my own clothing. We had to resign ourselves to giving them the address of my aunt, who lives in London, so they could send it to her should they ever actually find it. Then, the really bad part of my story begins. The two weeks went by without any news from them. I was basically scouring stores for any scrap of clothing that appealed, toiletries and other bare necessities. Weirdly, it made me feel homeless. I pestered my mum every now and then for updates. She called my Aunt Carol, checked online, but to no avail. Towards the final lap of our journey, when I was beginning to think I was never going to see my stuff ever again, she suddenly came into my room and told me what the bastards had actually done to it. They found it, but apparently hadn’t bothered with reading our explicit instructions or with calling one of the many numbers we left for them. Instead, they quietly snuck it on a plane back to JFK and washed their hands off us, so they thought, for good. When I got to JFK, I could hardly be blamed for rushing to Baggage Services as directed, glowing with the idea of actually possessing things once again. My elation died down when I arrived in their holding compartment and thoroughly searched it, only to find that my suitcase was still nowhere to be seen. I had to make yet another report, this time with JFK, who informed me that Heathrow hadn’t even bothered letting them know that it had arrived, as is standard protocol. I went to my hotel fuming, wondering where it could possibly have been if that was the only baggage service for BA there. The next day, I called them multiple times again before someone answered. I asked if they’ve found it, and the woman on the other end threw me another shockbomb: they sent it to my apartment in Charlottesville, VA at 7am on the day I arrived! Yet again, they hadn’t cared to find out that I wasn’t going to be back till 7:16pm on the next day, which meant that it would have been outside for three full days by the time I got home. Now, I live right next to some dodgy railroad and a neighbor that we’ve suspected of dealing drugs for a while now. There was no end to the possible occurrences that have befallen it within that span of time. I had literally chased my bag across the Atlantic, only to run the risk of having it stolen right outside my front door. The very thought made me homicidal, sadistically so. As my previous posts on Day I and Day 2 have indicated, most of the fish we’d encountered were on our plates, steamed, stewed. Appreciating them for their aesthetic, rather than culinary, value was nice for a change; I’m exactly the kind of person who likes looking at fish as much as eating them. Call me Asian, I guess. 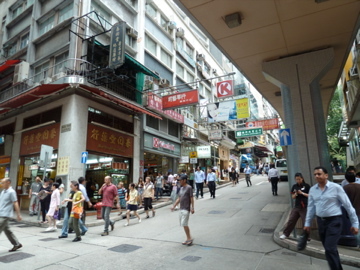 Fish Street is located in Mongkok, which on the Tsim Sha Tsui side of the city. 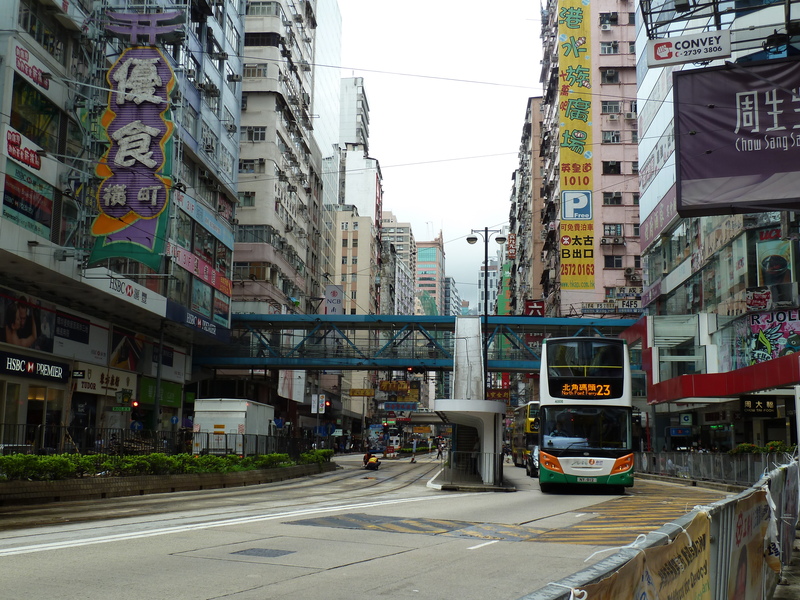 We took the metro across the strait and surfaced in a section of the city that seemed a lot more “down home”, less trendy than Lan Kwai Fong. There were a lot of small neighbourhood shops, the types where you get giant bottles of shampoo for a dollar and dried fruit. 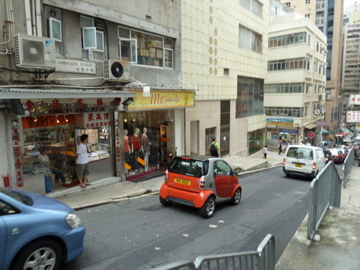 It was a little hard to find Fish Street itself, among the untidy sprawl of the dime stores and many, many street intersections we came across. 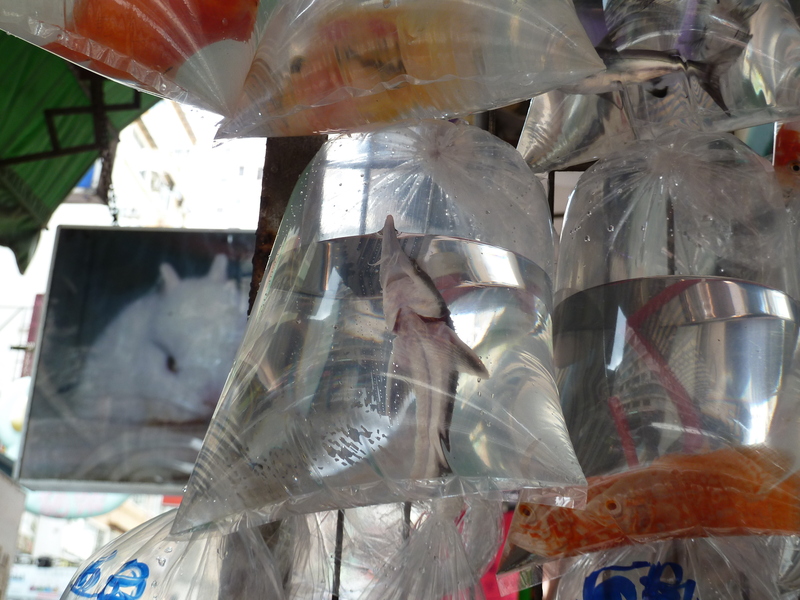 At long last, we came upon a series of fish signs floating above the heads of the passersby and stacks of tanks full of bright, predominantly orange, blobs swimming around in them. We had hit the motherlode! 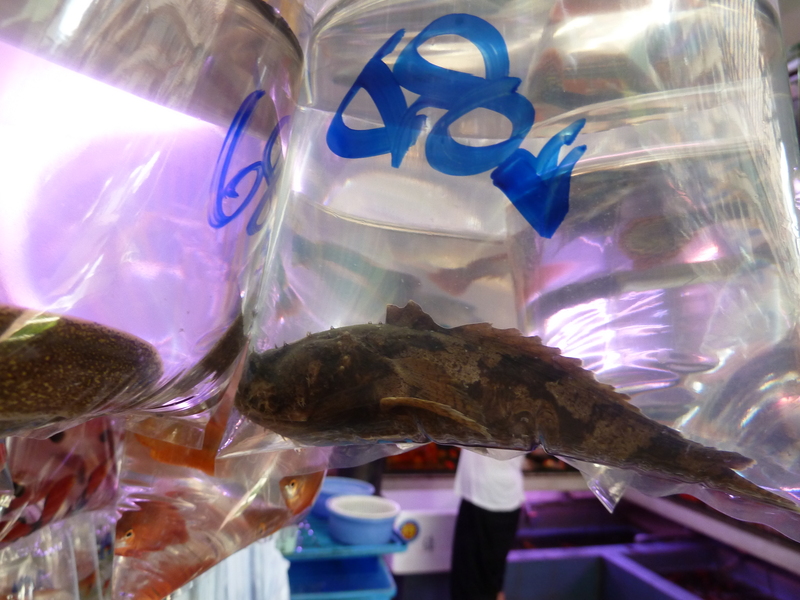 Unfortunately, we soon found out that we had arrived far too early to witness the spectacle of hundreds of aquariums and their exotic inhabitants lining the street. 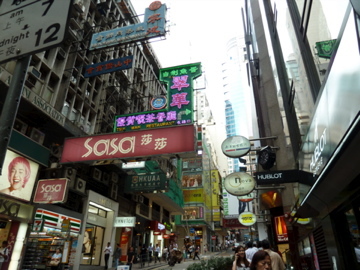 The shops that were open were few and far between; we wondered if everyone stayed up the night before to party in Lan Kwai Fong and Soho. Ah well. At least we were rewarded with a fraction of the full fish street experience. 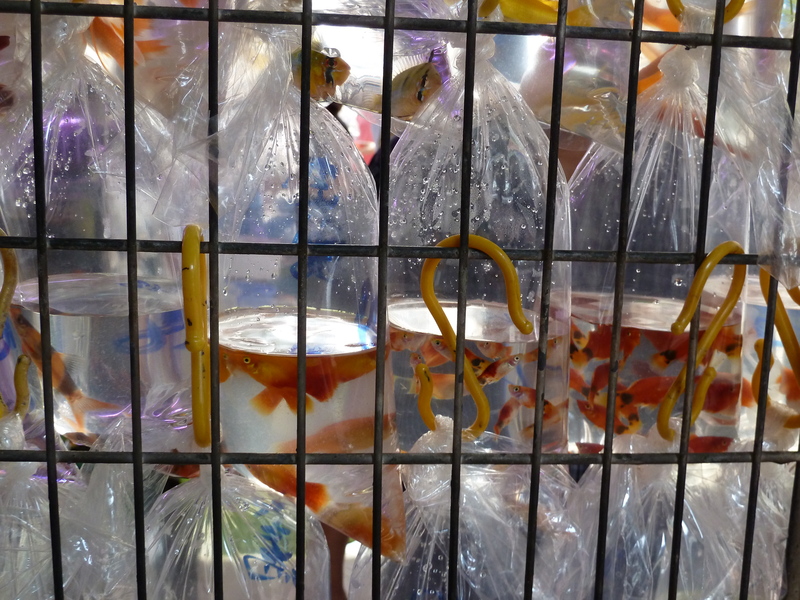 The places that were open displayed their wares in abundant clusters of plastic bags that collectively looked like the magnified spawn of some aquatic alien. What really interested me, quite aside from the display, were the creatures themselves. 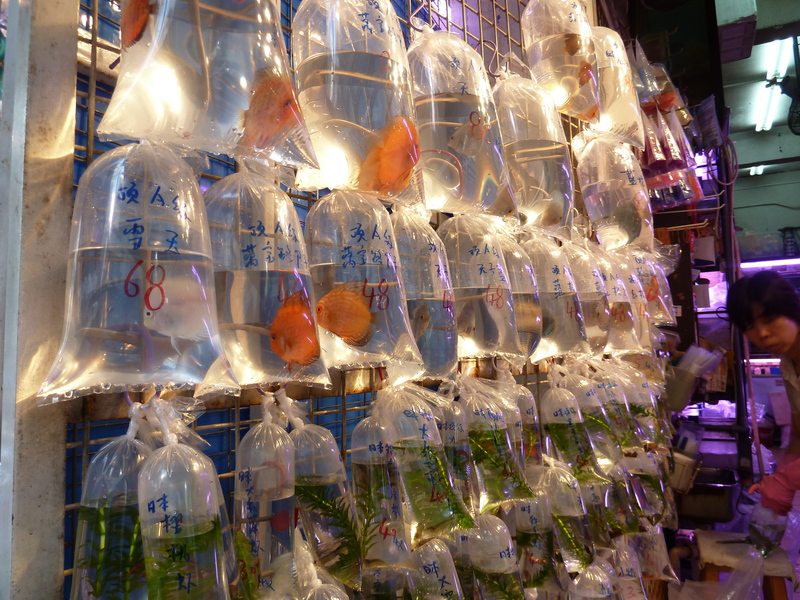 I’d expected to see only standard freshwater fish, maybe about two rare species of goldfish to set the place apart. I certainly hadn’t counted on encountering some of the animals, a few of which are quite possibly considered endangered…. My suspicions strengthened after we came across this store where they absolutely refused to let us take pictures of their merchandise. Granted, most of the creatures were probably photosensitive and hated flash, but still. Most of the inhabitants of the tanks were marine, and were not restricted to a few clownfish and anemones. 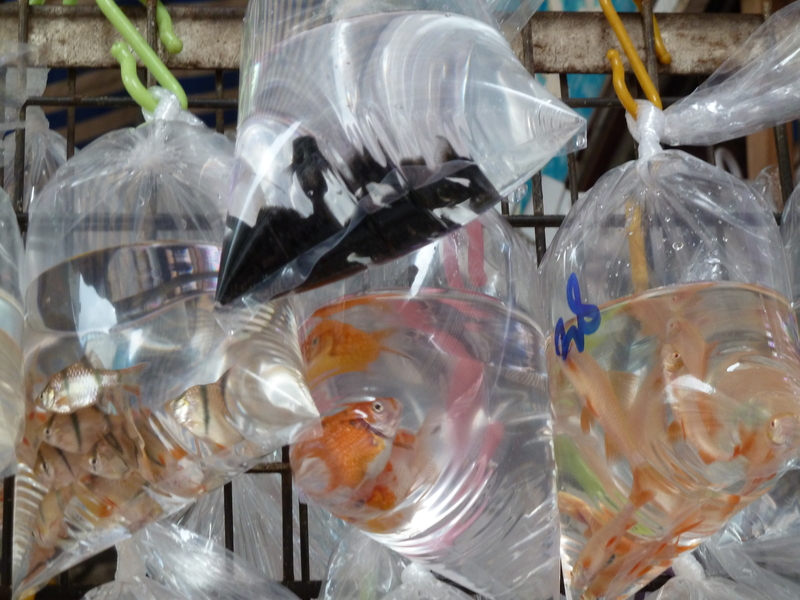 There were rays, jellyfish, sea horses, and a whole slew of others that would not be the first things I look for when I go to a shabby, roadside store. It’s instances like this when I feel a bizarre combination of outrage and guilty admiration for the mother continent. Asians are well-known to be thoroughly cavalier about animal rights. 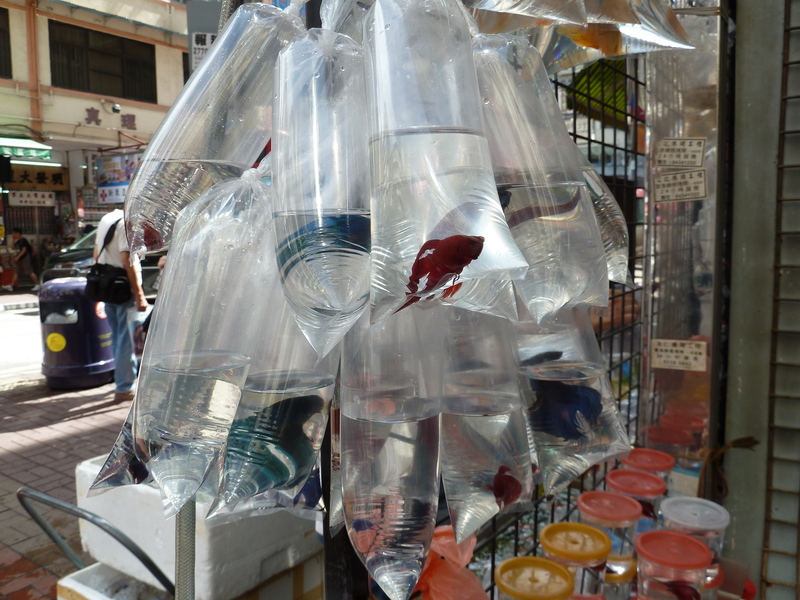 We’ll cram a bunch of ailing fish into a tank with barely any breathing space only to slice them up while they are still alive, nonchalantly chop fins off of sharks and toss them back in the sea, and fill claw machines with jars of little critters (no kidding, saw this in Japan). I don’t condone animal cruelty at all; as a kid, I used to be traumatised for days after watching those sobering ads on the Discovery Channel about shark find. However, there is definitely a part of me that feels ever so slightly refreshed by our political incorrectness. What we did next doesn’t sound too exciting on paper; we went to a mall. 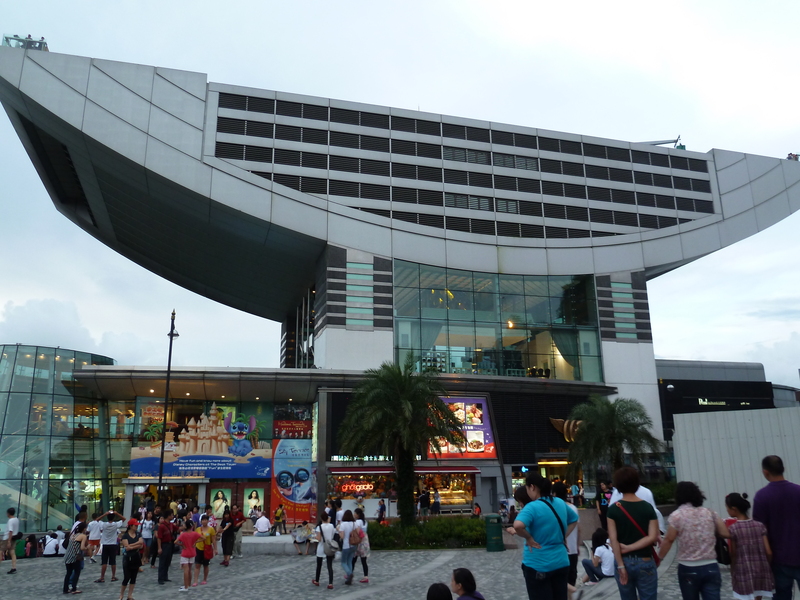 However, this is listed as part of the quintessential shopping experience in Hong Kong. 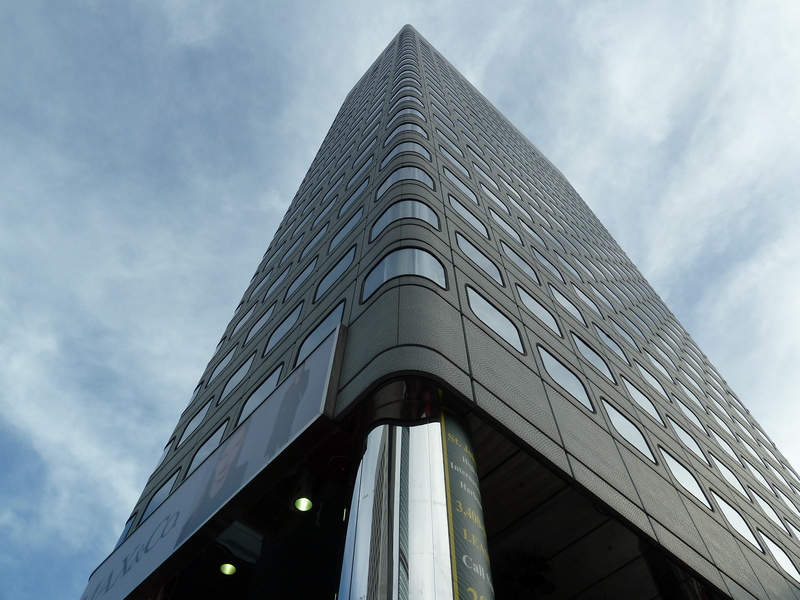 I was initially sceptical myself, but Langham Place was an evolved specimen. Even as far as aesthetics went, it attempted to impress. The architect probably envisioned some form of sculpture when he drew the plans. Content was not lacking either. Instead of the generic Gap and Zara chains, we found quirky, even avante-garde Japanese brands in abundance. And Muji was ridiculously well stocked. 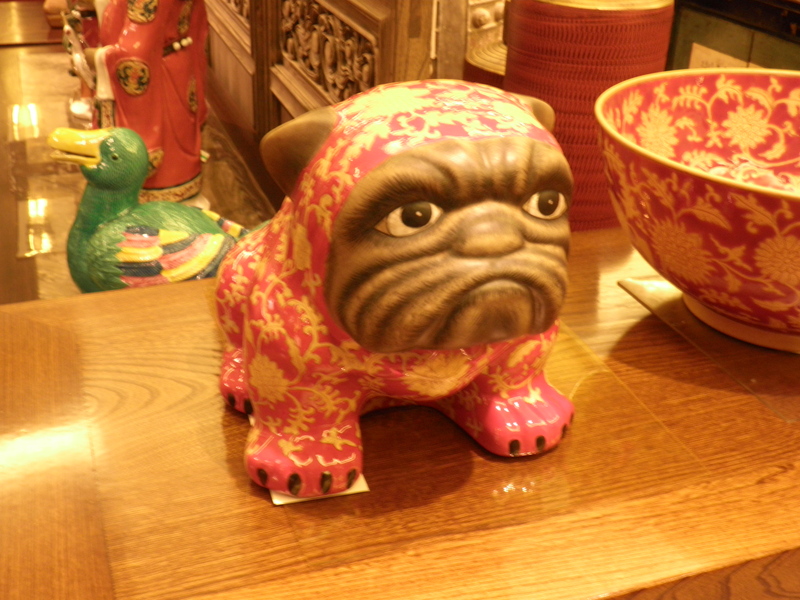 Yep, the mall was definitely run by Japanophiles. However, we didn’t get much of a chance to forget where we were. At lunch in a fancy tonkatsu place, the chef bellowed loudly at one of his underlings for all to hear in a display of very local effusiveness. Not quite the image of Japanese restraint, I imagine. 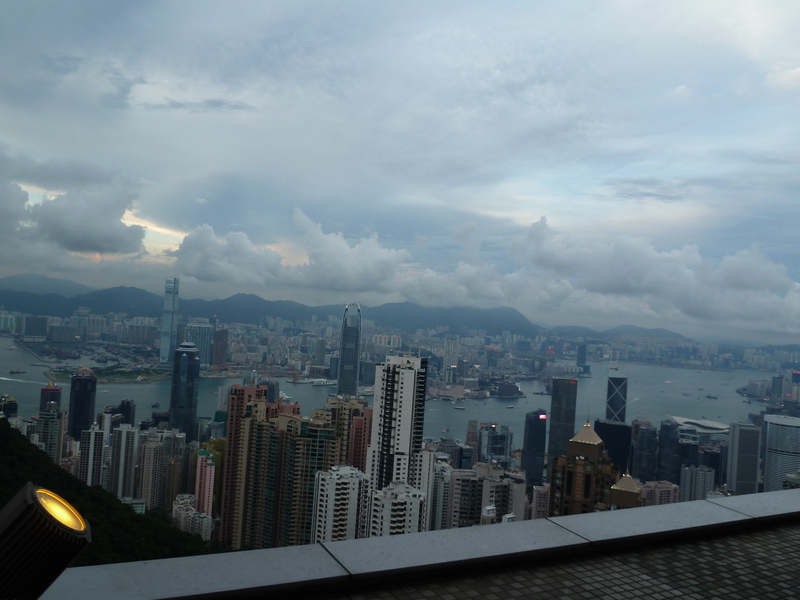 We’d put off Victoria Peak for a while, but as it was the last day, we didn’t have much of a choice. We braced ourselves for the queue, and weren’t disappointed. Like a vast tapeworm, it looped several times around the tram station to accommodate traffic. As there were so many bends in it, we were treated to several interesting vantage points of some very important public service announcements stuck on the fences surrounding us. 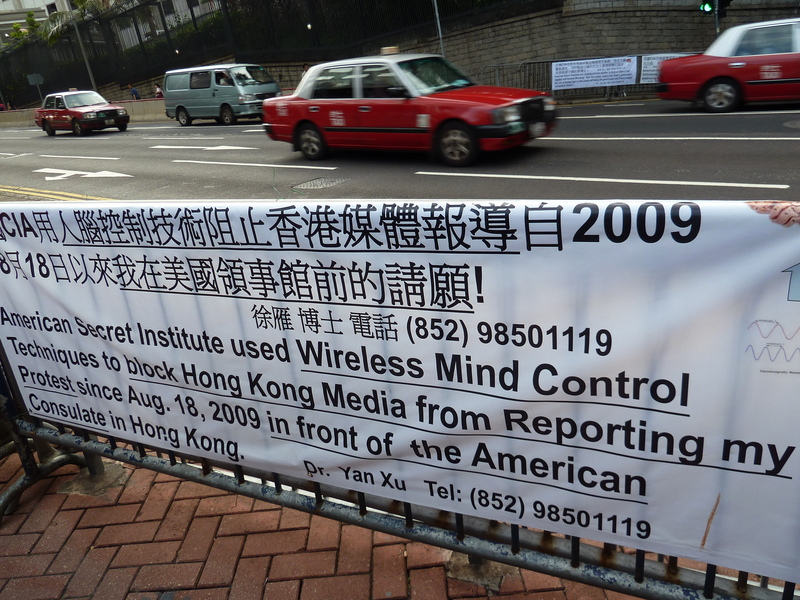 In case that was difficult to read, the CIA is using wireless mind control! Osama was a victim, and you will be too if you don’t watch out. If you have any concerns whatsoever, give Dr. Yan Xu a call. The world is a dark, dark place…..
His choice of venue for his ads was a pretty strategic one. 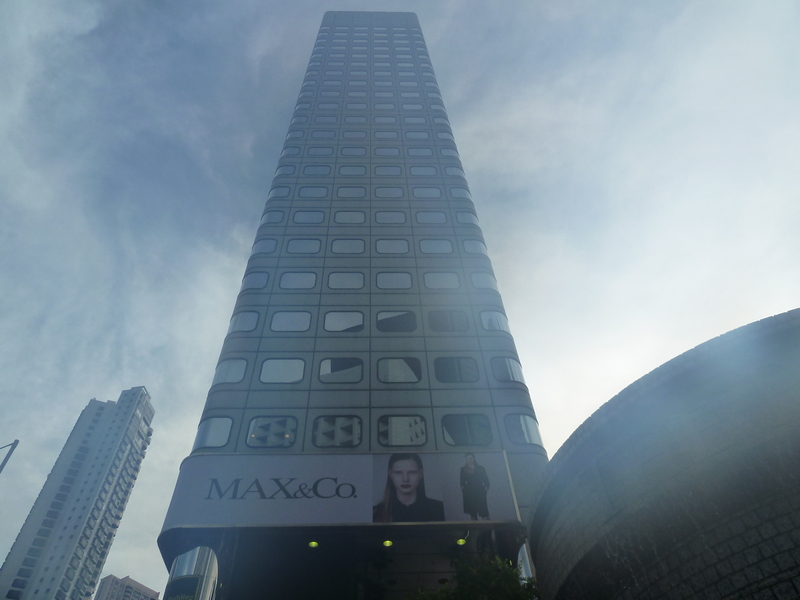 The building towering over us would have been right at home on a mind control facility. In Mars. If not, you only got views in segments. 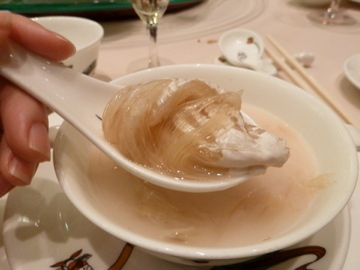 The best shark’s fin I can profess to have had, in clusters in a golden-brown broth.. 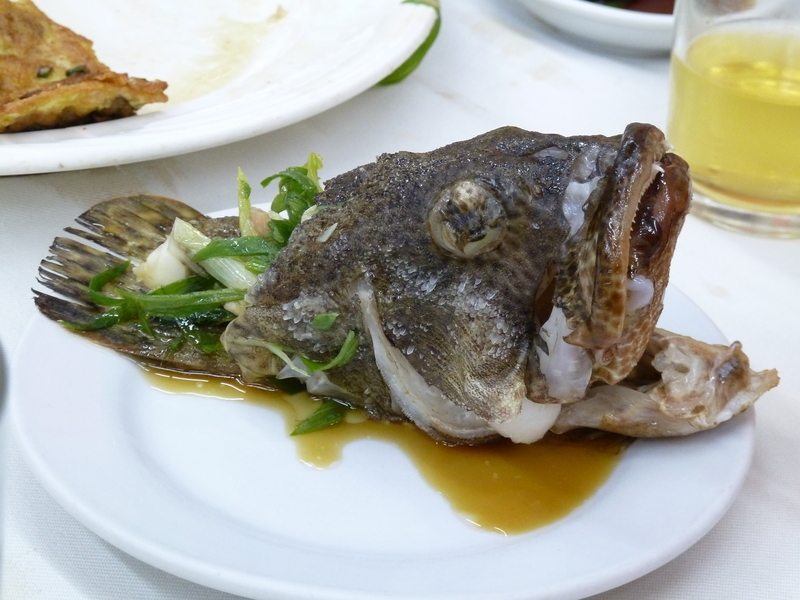 The inevitable whole steamed soon hock. Make a note to yourself, steamed in soy is the best way to eat fish, hands down. I'm getting hungry looking at this. Are you? 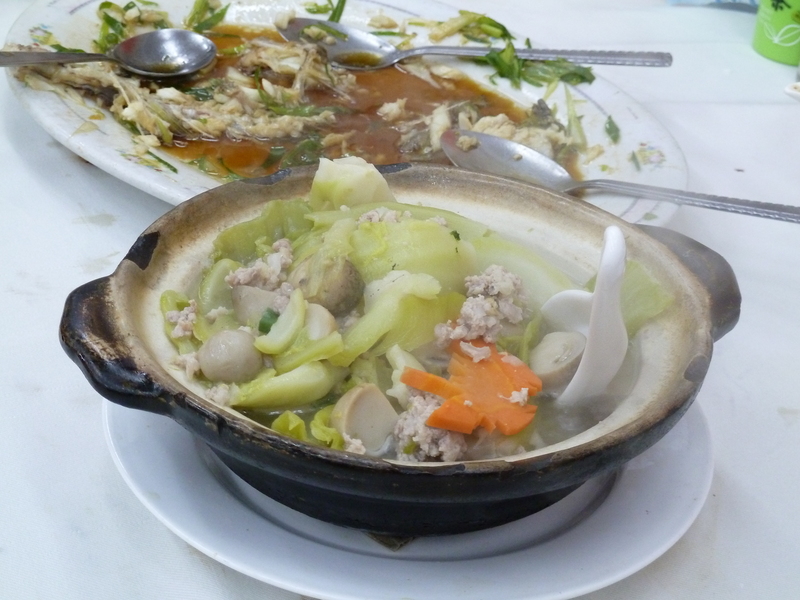 And bitter gourd steamed with stock in a claypot with pork mince. 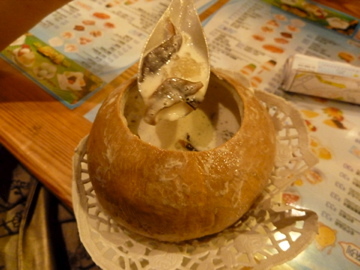 This was the best meal we had, on a trip where there were virtually no bad meals. Wicked! We decided to spend our last day doing what we do best, eating. 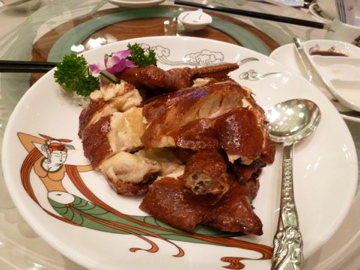 We decided on Yong Kee, supposedly the best place in the city for roast goose. Now, my parents had been there about ten years ago and were disappointed, but we bowed to the accolades and peer pressure and went. It was duly crowded, with a combination of locals, gweilos and mainland tourists jostling to get in. We were all assigned numbers and told to occupy every available square inch of space on a staircase landing, in anticipation of our food. Thankfully for us, the wait lasted only (!) half an hour. We were ushered to our seats and soon found out that my parent’s former dissatisfaction with the fare was rather unfounded. Maybe they were just having a bad day? 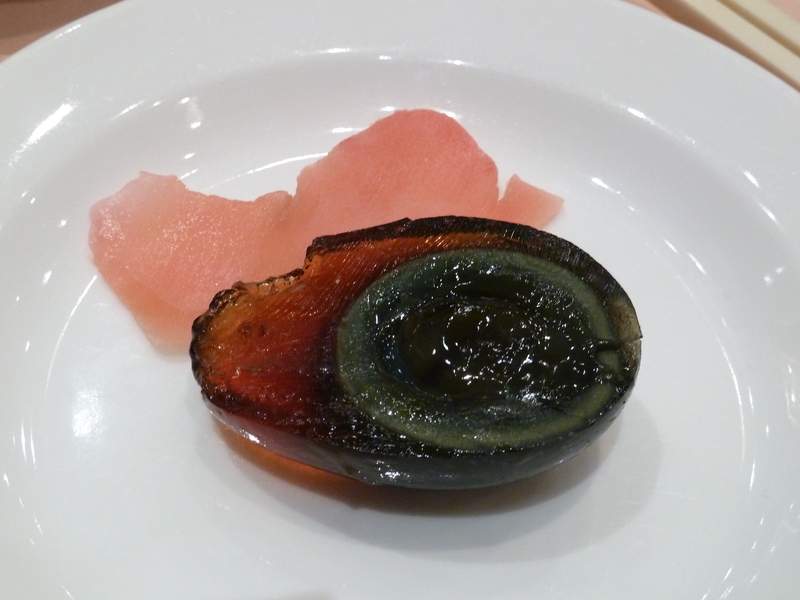 To start with, century egg. I’d always been brought up to think of century egg purely as a textural component, rather than a dish with any particular culinary merit of its own. Obviously, the people working here would have been aghast, had they been aware of my barbarism. They’d elevated it to an art form, with the tea-coloured “white” beautifully translucent and richly brown and the yolk disintegrating to semi-liquid bliss at its core. In other words, wow. This was what we came here for. 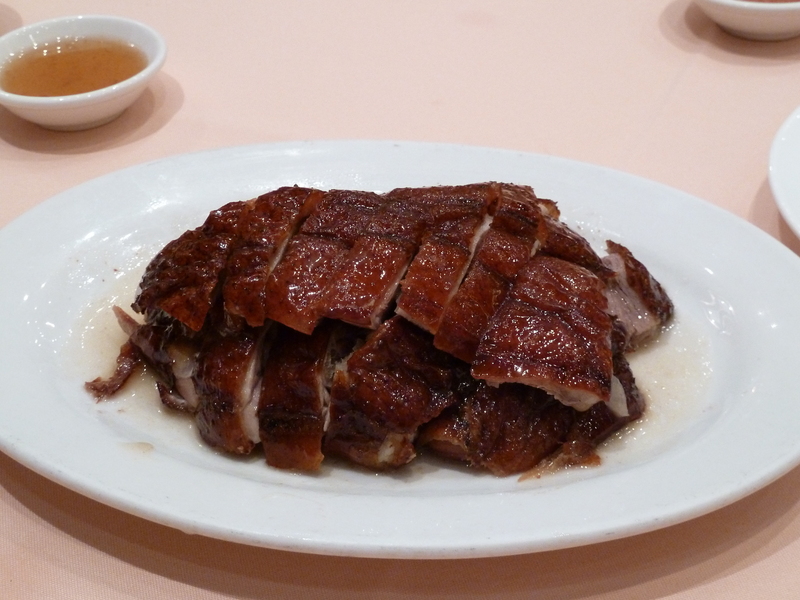 It’s so much better than roast duck, gamier and more intense. Add just a hint of the spicy salt it came with, and it suddenly took on a crisp, tangy edge, the very definition of umami. My dad wanted some larger pigeons than we had the last time, so we ordered some. It turns out that the guy knew what he was talking about. These were bigger, but they didn’t have the same concentrated flavour is the last batch and were just alright. However, they made for very artistic, macabre photo opportunities, which were graciously set up by our obliging waiter. As we are on most vacations, we were sad to leave. It was for all the usual reasons; we’d spent too short a time there, we’d miss the food and shopping, and we were just getting used to the place. However, the last reason played a larger role here; it took less than a day for us to feel at home. 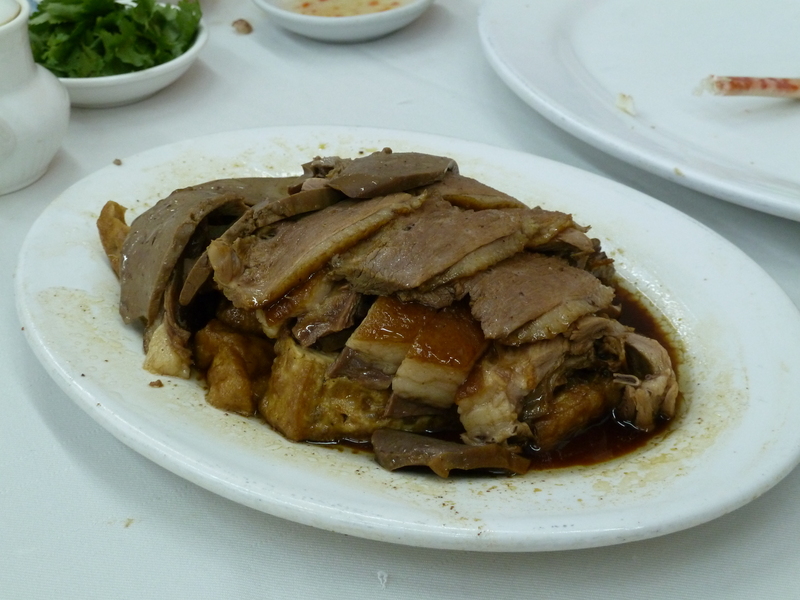 It may have been the excellent food, which put the Cantonese fare at home to shame but still seemed undoubtedly familiar. 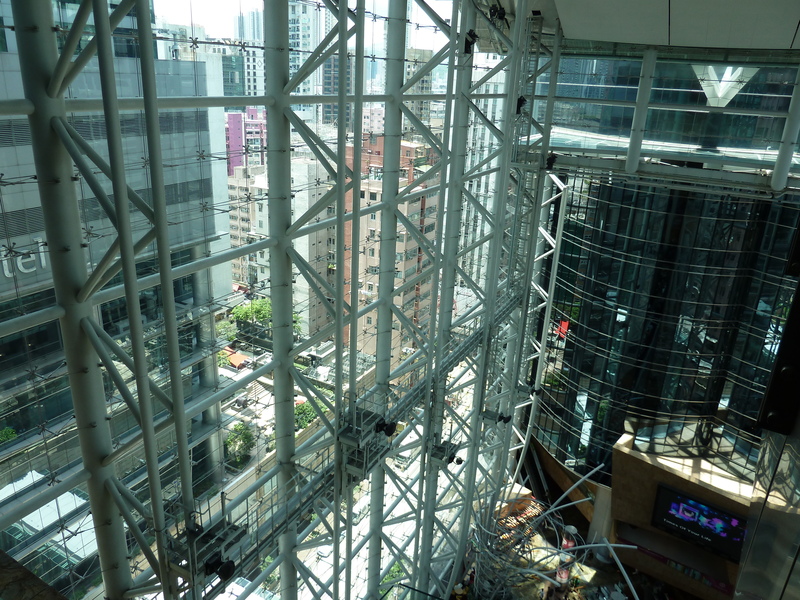 The snatches of Cantonese everywhere around us were at least half-intelligible and made the intimidating, metropolitan space around us more friendly. It felt like we were visiting our immense extended family, so large in size, attitude, ambition and an innate sense of style that it needed its own brazen, autonomous capital. 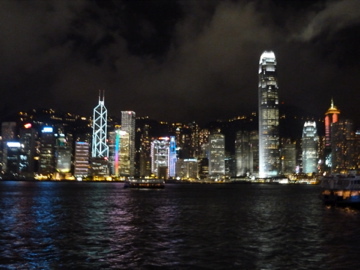 It is said that if New York is the city that never sleeps, Hong Kong is the city that never even sits to catch its breath. Yet, it made a pretty good pretence of slowly rousing itself to greet the day. 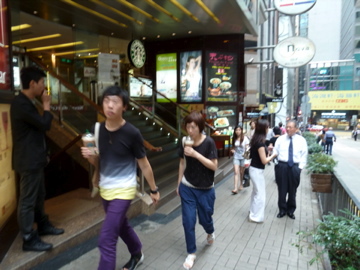 The daytime denizens of the city were gradually opening up shop all around us. 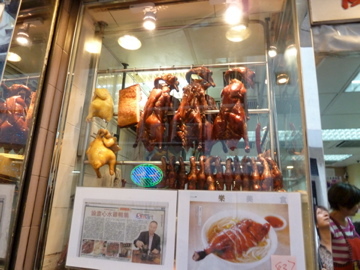 We saw queues of people waiting outside shop lots selling congee and yew char koey, conversing raucously. The iconic double decker buses and Cadillac sized taxis formed the backdrop to the steadily increasing hum around us. Add the vibrant signs in Chinese that glow neon even in bright daylight and you have before you a pretty invigorating, atmospheric scene to wake up to. And I say this having been brought up in another bustling, “exotic” Asian city. Well, what did we do today? 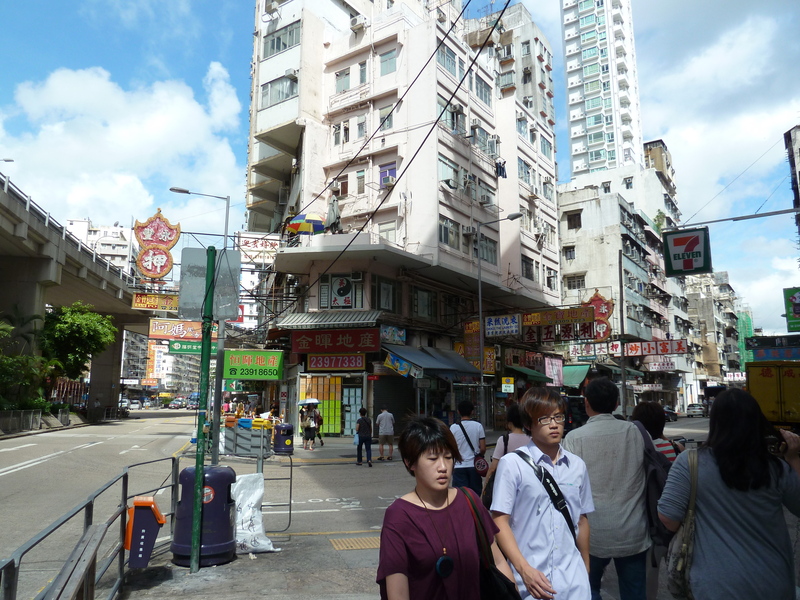 After some very good congee, unfortunately eaten amidst a gaggle of boisterous Little Emperors, we took a van from Causeway Bay to Stanley Market. It’s a bit of a ways off from the city proper, so we drove for about 45 minutes on a path cut into lush, verdant South China Sea coastline. It actually looked a good deal like the tropical shores back home, with the same humidity and polluted water but without much beach to speak of. Stanley Market proved to be a little too touristy for us. Not to sound elitist, but it was somewhat grating hearing my parents play the tourists and feign ignorance of their native tongue by speaking in English to the vendors. I can’t exactly explain the linguistic shift, but I’m chalking it down to the atmosphere of foreign backpackers and cheap mass-produced souvenirs. We left pretty soon afterwards. This excursion took up quite a bit of the day, so we ended up heading back and emerging from our rooms only at dusk to feed, of course. But first, some shopping. 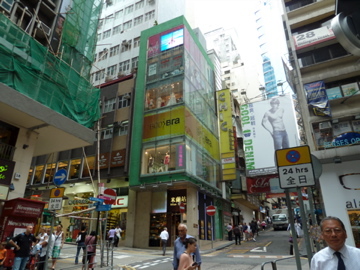 We headed back to Lan Kwai Fong, which was becoming a bit of a favourite with us thanks to its quirky (but expensive) boutiques and ridiculously steep, narrow streets. Again, I should really have taken more pictures. Our next encounter is one that sticks in my mind as one of those interactions with locals that are such an essential part of every travel journal. 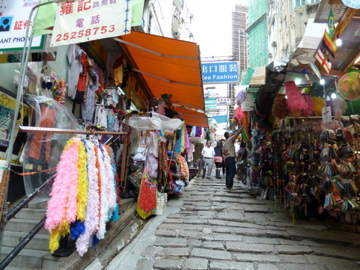 My sisters and I got into one of the small boutiques perched at an intersection of dramatically sloped streets. The windows were crowded with an array of eclectic inhabitants, from felt gorillas to vintage dolls wearing Sixties pop-art shifts. It just seemed to implore us to dive in and bask in the craziness. We were all quite nervous, as we were armed only with very rudimentary Cantonese skills and were bound to run into misunderstanding at one point. Our worst fears were confirmed when the bubbly salesgirl launched into a excited tirade of greetings, questions and exclamations that I alone had to decipher, as my sisters promptly hid behind me the moment she opened her mouth. Surprisingly, I actually managed ok, despite one embarrassing moment where I asked her for “ears” instead of “earrings”. In my defence though, no one has ever described my ears as “cute” before; I simply assumed she was complimenting my earrings. At least I know the difference now. 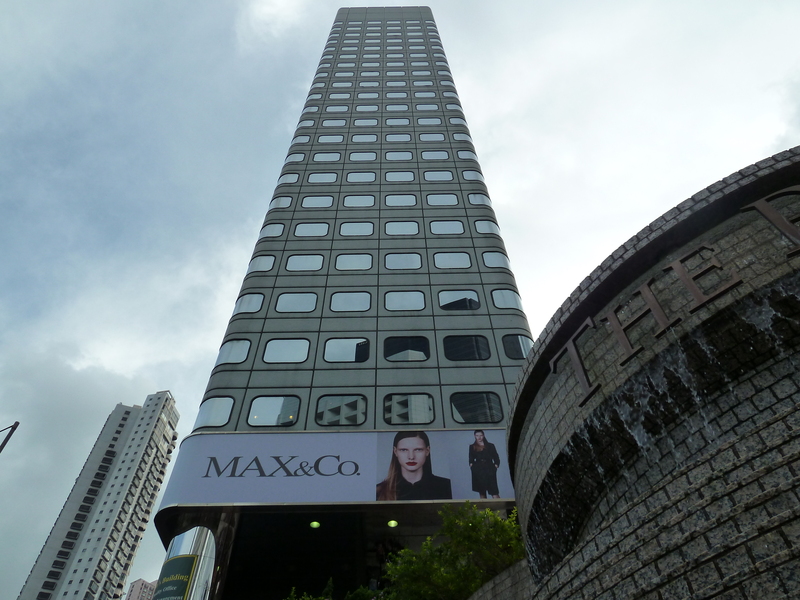 And she offered to come shopping with us in Causeway Bay should we ever end up in Hong Kong again. Dinner was a bit of an event. Happily, I was much smarter and actually charged my camera. Good thing, the food was definitely worth taking note of. 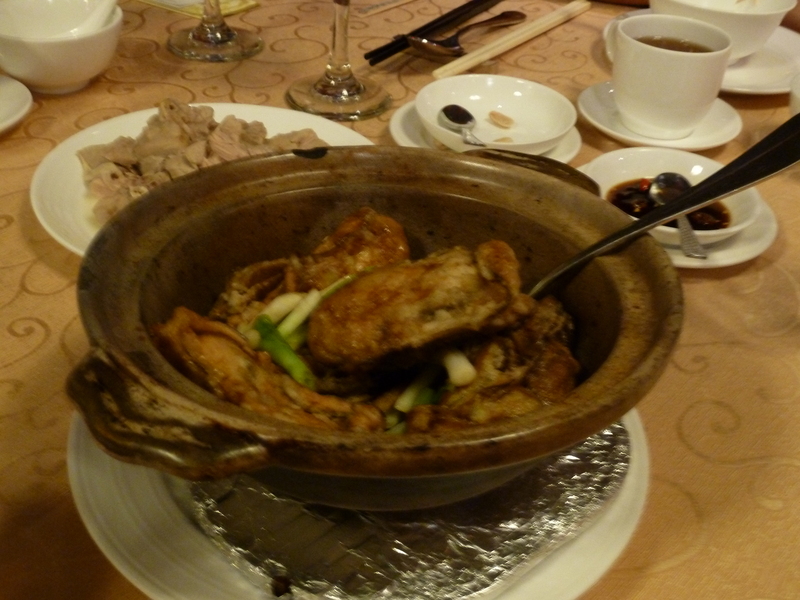 And then there was the deep-fried oyster hot pot, my personal favourite. Crisply savoury on the outside, luxuriant and redolent with pungent oceany flavour on the inside, they were probably the best cooked oysters I’ve had. 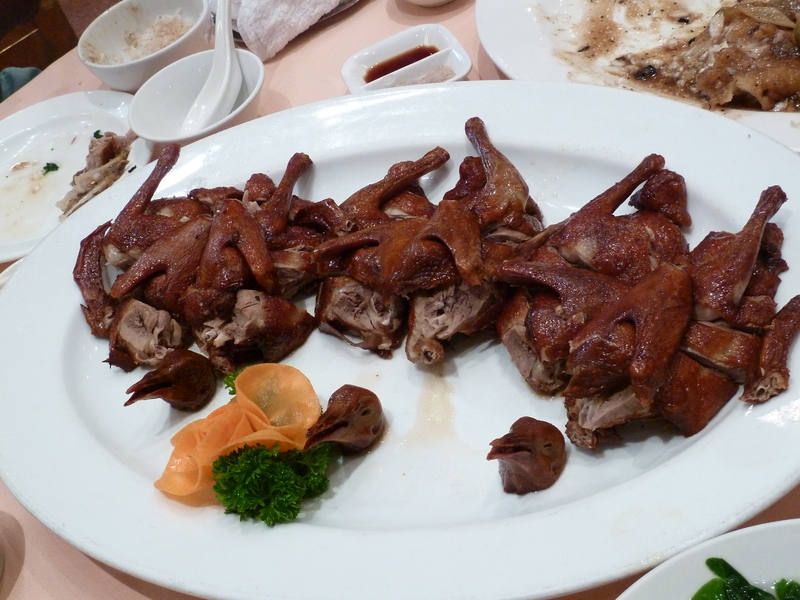 We decided we couldn’t leave Hong Kong without having our roast pigeon. 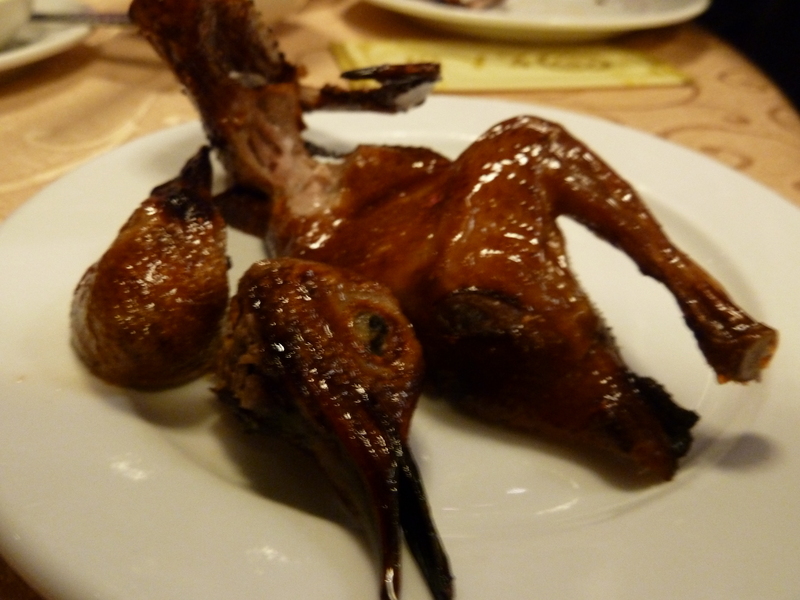 The restaurant’s version was dense, rich and gamy as all good pigeon should be, but we were a little disappointed by the size of each scrawny bird. 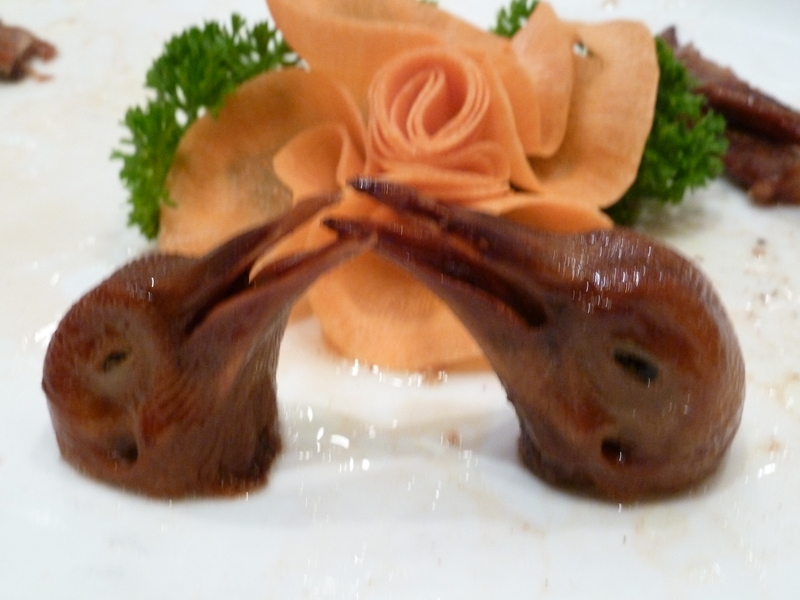 However, the manager assured us that we were not simply getting the short end of the stick; apparently, the ganglier the pigeon, the more flavourful its meat would be. Concentrated juices, methinks. 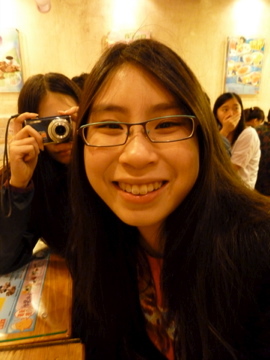 After dinner, we wandered around Soho and Lan Kwai Fong, checking out the nightlife. Admittedly, it was a little awkward with the parents and little brat sister (you know who you are!) in tow. Moreover, at the risk of sounding like a snob again, I must add that the drunk, rowdy gweilos weren’t helping the situation too much. 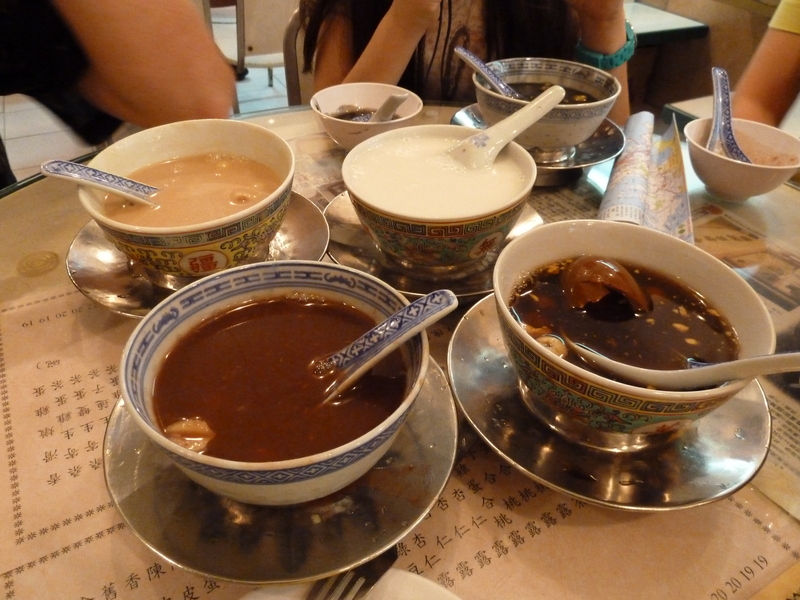 We decided to look for some tong shui, desert in a soup. With the help of yet another taxi driver, we found a very, very local hangout that would have been virtually invisible to the untrained eye. 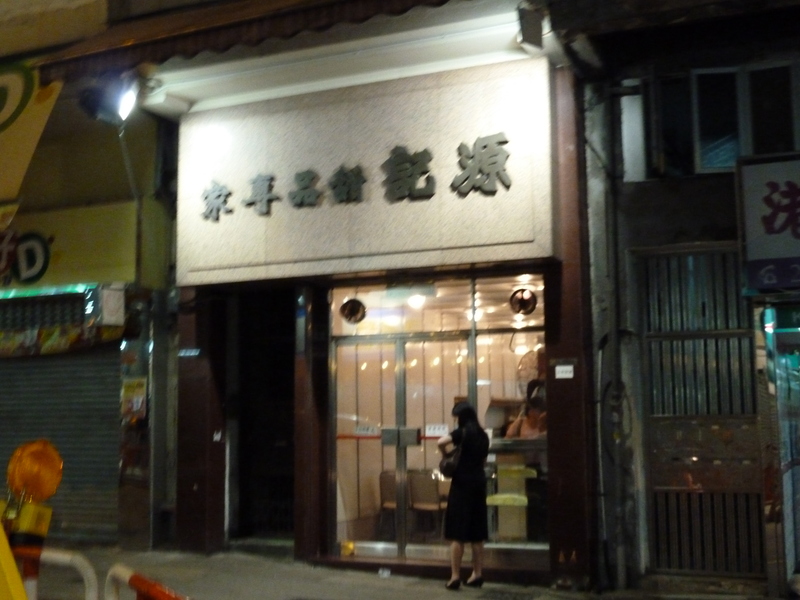 This shady looking joint was apparently well-known among insiders as the place to have tong shui. And we can attest to this. 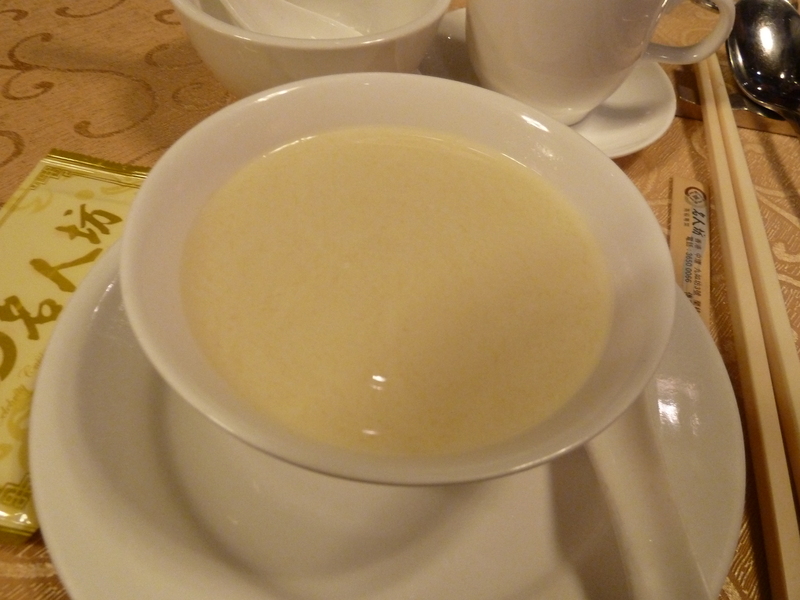 The desserts served were of the traditional variety: creamy walnut soup, red bean soup, almond soup, and kai dan cha (egg tea, with an actual hard-boiled egg floating in murky brown liquid). This was the very antithesis of the bright dessert place of yesternight filled with teenagers and pretentiously fancy concoctions. It was simple, no-frills and superb. And sadly a dying business; not a single waiter or cook there was under 40, by the looks of it. This was quite the antidote to the foreign invasion at Soho. I just felt lucky we actually got to sample these before the owner’s grandchildren sold the business and turned it into an Apple store. Anyway, before I get carried away with the cliches, the trip itself. Contrary to how it may sound, it wasn’t some month long sojourn with distant relatives, but a three night stay to get away from the monotony of summer and my dad’s laborious building projects. However, for such a short trip, it sure made an impression. The fun began as soon as we got onto one of the ubiquitous cadillac-sized taxis and drove towards the city. It had obviously just been raining; the sky over the many condos set in the lush hills was ominously cloudy. The driver confirmed this, and then some. We had apparently arrived on the tail of a fairly strong typhoon that had just struck that morning! 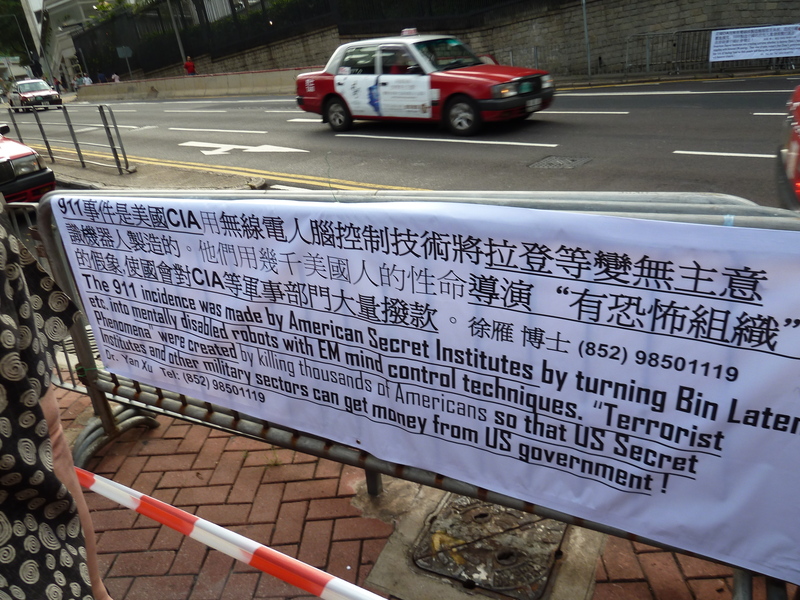 Quite astonishing, as we hadn’t been aware that HK was plagued by these. When we got to the city itself, the adjectives that came to mind were “ultra-contemporary”, “developed”, “indestructible” even. It was a considerable testament to innovation, progressiveness and capitalism; the very notion of a typhoon there seemed a little incongruous. However, when we disembarked, the wind just about backhanded us. A typhoon? No kidding. Yes, despite the continuing showers and the sight of a few unfortunate trees suffer whiplash at the hands of invisible forces, we thought with our stomachs as per usual and got the hell out of the hotel. 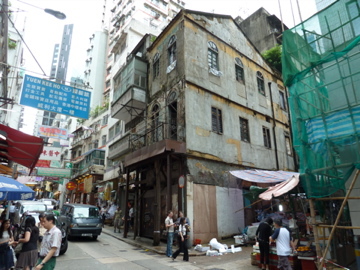 We headed to Lan Kwai Fong, an area known for its clubs and crazy, crazy nightlife. 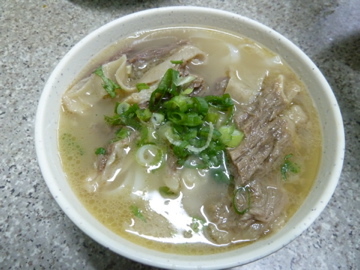 There was this place that was renowned for its ngau lam mee, beef tendon soup noodles. 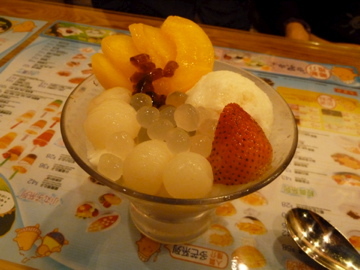 Although we initially headed to the wrong restaurant, we finally found the place. It was in a cramped shophouse reminiscent of some of the older noodle joints in KL, replete with wet floors, great milky tea and backless stools. To my relief, we didn’t look too out-of-place. There was another table filled with non-Cantonese speaking Asian kids looking out of place and letting their parents order for them. I even knew a little more than them and was able to fake some street cred! And the main event, the food itself, was a spectacular thing. The soup in the tiny bowl was a beautiful, rich translucent yellow, hinting at the juices and fat melted into it from the meat. It tasted every bit as good as it looked, the fragrant meatiness of the broth coupling perfectly with the slippery smoothness of the noodles. 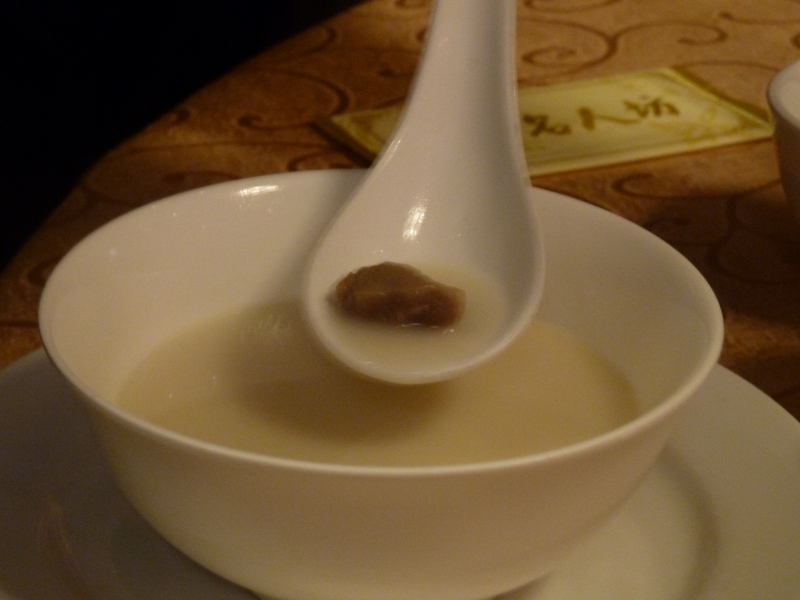 The tendon was in no way chewy or stringy, but was so unctuous that it seemed almost like a gelatinous portion of the broth, with more flavor and texture of course. Even through all the indulgent greasiness, it somehow managed to remain light, balanced and just filling enough. With that out of the way, we explored the neighborhood. 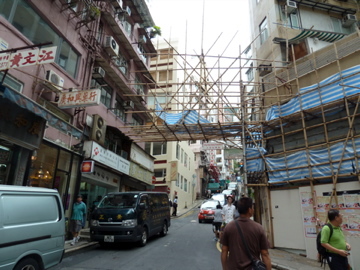 Now, I wasn’t overly keen on exploring Lan Kwai Fong on this trip. I’m sure I’m not the only one who thinks that nightclubs and parents do not a happy union make. Plus, hanging around a clubbing district at noon sounded pretty counter-productive to me. But upon our arrival, all those pesky pre-conceived notions were abolished soon enough…. I mean, just look at it! Streets steep enough to rival San Francisco’s, crumbling shop houses, indie boutiques, that Tokyo-style clustering of neon signs…. This place has character. It probably owes a lot of its upfront personality to the hordes of locals that swarm this area. Everyone here was no-nonsense, fast-walking and very, very well dressed. The crowd was just very daring with dress sense, lots of silver, purple, bright pink, but it all came together somehow. The metrosexual men in particular caught our eye. After a much-needed nap, we tried to head out again. But the weather was not co-operating at all, so we were forced to seek alternative means of entertainment. 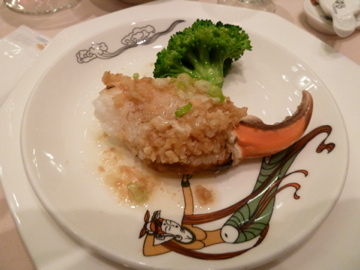 Fortunately for us, there was a Michelin star restaurant in our hotel. So naturally, we decided to sate our hunger in style. The char siew was the most tender I’ve ever had, with just a hint of savouriness peeking through the sweet marinade. 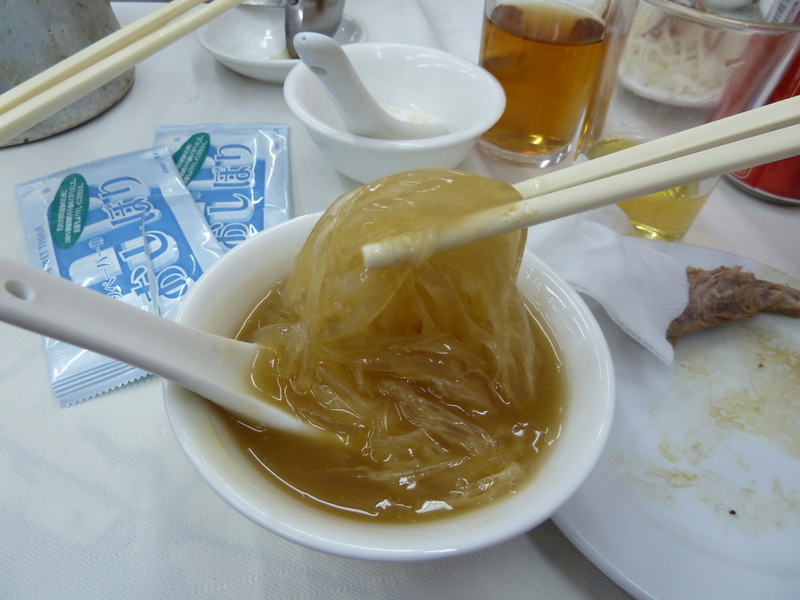 The shark’s fin came in luxuriant spools in a clear consomme and was just the right texture, crunchy and gelatinous. The latter two dishes were all about letting simple, natural flavour shine through without overwhelming it with heavy handed seasoning, a very Cantonese approach to dining. What can I say, it was nice to accidentally stumble upon a place that actually deserved the hype. After dinner, the weather decided to lighten up. 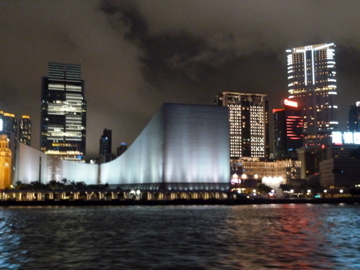 To make the most of it, we decided to hop on the much-lauded Star Ferry to Tsim Sha Tsui and see what the fuss was all about. As it turned out, it was about plenty. 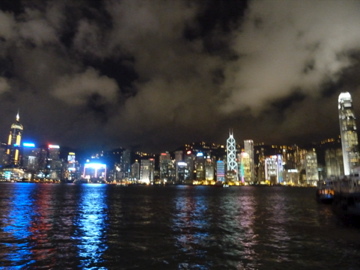 The Hong Kong skyline is probably among the most beautiful I have had the good fortune to witness, and I’ve seen a lot of skylines. 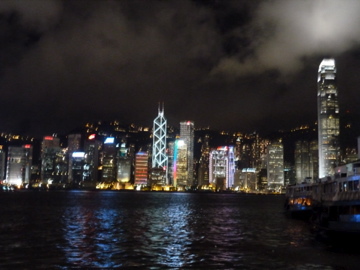 From the water, the outlines of buildings are crisp and clear even against the murky sky. The coloured neon lights enhance their silhouettes and illuminate any clouds present from below, like stage lights below billowing dramatic puffs of smoke. They also stretch out onto the shimmering liquid surface below and become distorted by it, in direct contrast to the panorama above the water. 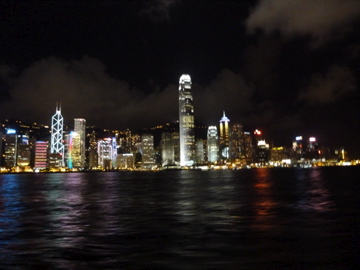 The whole spectacle rises up around the ferry and surrounds it like a kind of open, vast canyon of skyscrapers. Warning: It is possible the pictures I took did not do it justice. Apparently, even being passive spectators of this magnificent scene piqued our appetite. 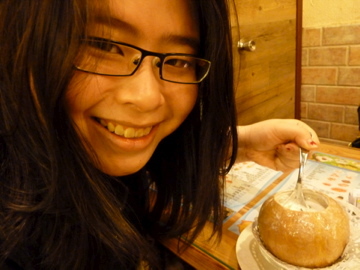 So when we got to Tsim Sha Tsui, we kind of had to eat some more. We chose this extremely bright, cheery joint that served the kind of fancy, colourful fusion-ish desserts that have become a trademark of young, hip Asia. Here are some of the concoctions we sampled. And all this was accomplished in, half a day? Wow. More to come! This was originally written for a German fairytale class just last semester. But my professor announced that the German department was holding its annual essay competition on German culture, in English! Who was I to turn this down? I went up to her and asked about it, and she told me I could just submit this particular work. No work and the prospect of winning a few hundred dollars? I would have been an idiot to resist. And as it were, I actually won second prize and 200 dollars! On a number of levels, Bluebeard is a reverse fairytale. To begin with, it deals not with complications within the immediate family, such as a perverse father or cruel stepmother, but a poisoning of marital relations. The fairytale concept of marriage to a handsome prince being the ultimate solution to the heroine’s woes is abolished; it is instead replaced by the somewhat novel idea of matrimony being the cause of her distress. The heroine no longer has to face the child’s fear of abandonment or betrayal by parent figures, but she has grown up and is now confronted with the troubling new possibility that her Prince Charming could in fact, be a monster. The Bluebeard stories force her to deal with her problems in a surprisingly realistic, mature manner. She obviously can no longer put her trust in a strong suitor to save or protect her, as her relationship with her husband can attest to. She has to rely solely on her own ingenuity and cunning to extract herself from her unenviable predicament, very much like a woman in the real world would have to. Also, her family, generally the bad guys in the context of the traditional fairytale, is a significant help to her, as they probably would be should a girl actually encounter marital woes. However, not only are the means in which Bluebeard’s heroine attains freedom down to earth and sensible; her problems are the authentic fears of wives personified. Bluebeard is the contemporary sequel to the traditional folktale; it focuses on a now fully-grown heroine who has to deal with her very adult challenges armed with her wits. Moreover, it displays a highly modernist tendency to acknowledge the actual fears of a married woman, rather than avoid them or fob them off with happy endings that don’t necessarily happen in real life. Jack Zipes makes an insightful comment on the prince’s role in Disney’s version of Snow White: “If we recall, it is the prince who frames the narrative. He announces his great love at the beginning of the film, and Snow White cannot be fulfilled until he arrives to kiss her” (Zipes, 349). Whether or not the prince was directly involved in the actual plot, his redemptive role for the heroine is implicit in the storyline. This is far from the case in Bluebeard; rather, the troubles begin as soon as the groom comes to collect his bride. In Fitcher’s Bird, this is enacted quite literally: “He asked for something to eat, and when the eldest girl went to the door and was about to hand him the piece of bread, he just touched her and she jumped into the basket” (148). The marriage here starts off nothing short of abduction; the girl is forcibly taken even before she can glimpse her future husband. In other versions of the tale, even when she does get to meet him before their wedding; his very countenance is foreboding. In the Grimms’ The Robber Bridegroom, “But the girl didn’t care for him as a girl should care for her betrothed, and she didn’t trust him. Whenever she looked at him or thought of him, her heart filled with dread” (151). Indeed, Bluebeard is a far cry from the idealized suitor of folklore. In all the stories, it is not merely his appearance or lack thereof that is cause for concern; he is also a savage murderer who kills and mutilates any of his young brides too curious for his liking, as is shown in Fitcher’s Bird: “You entered the chamber against my wishes,” he said. “Now you will go back in against yours. Your life is over” He threw her down, dragged her in by her hair, chopped her head off on the block, and hacked her into pieces so that her blood flowed all over the floor” (149). All in all, unlike Beauty’s Beast, he is a monstrosity both inside and out. He personifies all the fears a young woman may harbor about her bridegroom and suggests a highly disturbing new possibility to the plot never even considered in most fairytales: what if there is no happy ever after? What if the handsome prince was really a devil in disguise, promising sweet nothings to an unsuspecting damsel in distress in order to destroy her? If this were a traditional fairytale, the young heroine would be absolutely finished. Perhaps, the assertion that Bluebeard is in any sense germane to actual marital issues inspires incredulity. After all, it may see, an exceedingly rare, exceptional misfortune to find oneself married to a depraved serial murderer. However, in Bluebeard, the reality of the physically abusive, controlling, or simply unfaithful spouse creeps into the fairytale atmosphere and poisons the happy ending. Margaret Atwood, a renowned contemporary author, is one woman of today who has recognized this undercurrent of sympathy and understanding for wives. Her short story, Bluebeard’s Egg, may not be about a young virginal heroine of a fairytale, but her protagonist shares the same fear of discovering a monster in her husband, not so coincidentally while taking a class on Bluebeard. Sally seeks out the same solace in her marriage that many of her female peers today could relate to. She uses overwhelmingly wholesome terms, however cynically, to describe her husband, Ed: “Ed isn’t the Bluebeard. Ed is the egg. Ed Egg, blank, pristine, and lovely” (Atwood, 174). Yet, her assessment of him at the end of the story is completely at odds with this harmless, cuddly identity she has concocted for him, “But now she’s seeing the egg, which is not small and cold and white and inert but larger than a real egg and golden pink…glowing softly as though there was something red and hot inside it….the egg is alive and one day it will hatch. But what will come of it?” (178). As this segment suggests, she lives in mortal terror of unearthing something about Ed that will bring her happy delusions to an end. He is no murderer, but “As it is, everywhere he goes, he is beset by sirens” (160). Indeed, a man does not have to maim and mutilate to bring any hopes of a fairytale ending to a crashing halt. He needs only to pay attention to one of these sirens, and he will destroy his wife utterly. Just like the girls in Bluebeard and many of her contemporary female peers, Sally will never find the completion in her husband she craves if she were ever to probe into his inner world too deeply. However, the heroine does not have to stay trapped within the confines of a devastating union. When her beauty and maidenly virtue fail to save her from her extremely perilous circumstances, she is forced to utilize every ounce of resourcefulness she possesses to make it out alive. The heroine in Fitcher’s Bird is especially adept at wielding her wits. According to the Grimms, “..she was clever and cunning” (149). Indeed, she is so shrewd that she is not only able to keep herself alive, but miraculously resurrect her dismembered sisters, previously also wives of Bluebeard: “But she set to work gathering all their body parts and put them in their proper places: heads, torsos, arms, legs. When everything was in place, the pieces began to move and joined themselves together. The two girls opened their eyes and came back to life” (149-150). Some interesting details can be noted from this memorable instance. The young lady makes her own magic in this story. She does not wait for a fairy godmother or friendly woodland creature to grant her wishes, but instead becomes the source of most of the supernatural happenings that help her and her sisters escape. Also, she is quite noticeably not squeamish about blood or body parts, gritting her teeth and accomplishing her task no matter how unladylike it may be. She is an ideal woman, not in the traditional fairy tale sense, but in a contemporary way because she is very much a self-made individual who is not afraid to get her hands dirty to control her fate. Her devotion to her sisters in this instance also speaks of another notable change of dynamic; the family becomes integral in ensuring the safe return of the heroine. The last sentence of one of the tale’s versions, Mr. Fox, sums up the highly conclusive role her relatives play: “At once her brothers and her friends drew their swords and cut Mr. Fox into a thousand pieces” (Jacobs, 156). The family completely usurps the position of the prince, transforming his Kiss of Life into the bite of vengeful blades. Bluebeard is a welcome respite from cookie cutter folk tales that all culminate in marital bliss, simply because it chooses to acknowledge that life and its surprises do not end at the altar. Its use of extreme circumstances serves to highlight that finding out about one’s spouse’s debilitating flaws at the cost of your own happiness may well be a dreadful reality. One’s husband need not be a serial murderer in order to prove thoroughly inept at securing one any peace of mind or sense of completion. However, the Bluebeard stories do not serve merely to frighten women; they also offer solutions that one could certainly benefit from even in a real world context. They urge women to turn to resources that other fairytales either ignore or vilify: their mental prowess and their relatives. Certainly, these two, while not foolproof, are sometimes all one has in an environment where there are few constants and virtually no guarantees. There are perks to having a art student as a sister. She had to buy a present for this teacher with a very discerning eye for aesthetics, so we couldn’t exactly just hop into one of the megamalls here and get her some trite bath salts. 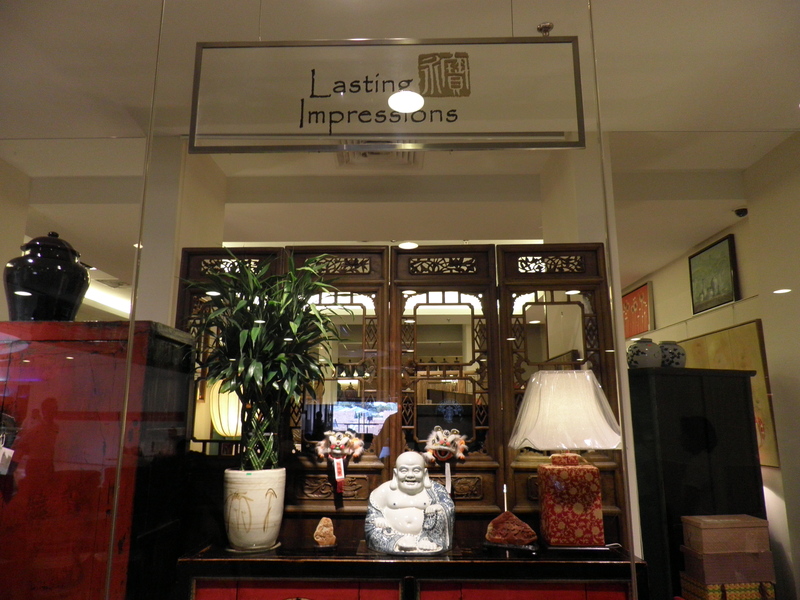 We had to scour a number of galleries and knic-knack stores for outstanding one-offs. As a result, we stumbled into an entirely different, very arty side to Malaysia that I’d previously never been exposed to before; I feel as though I never really knew my country before I left for college! 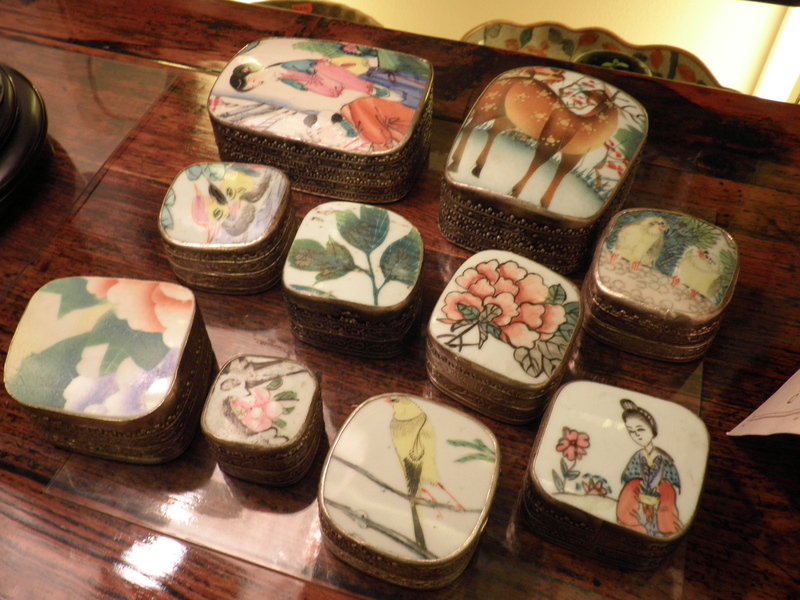 Fragments of 19th century porcelain vases embedded into little decorative boxes. It was hard to pick a favorite, but I particularly liked the one with the pink lotus. 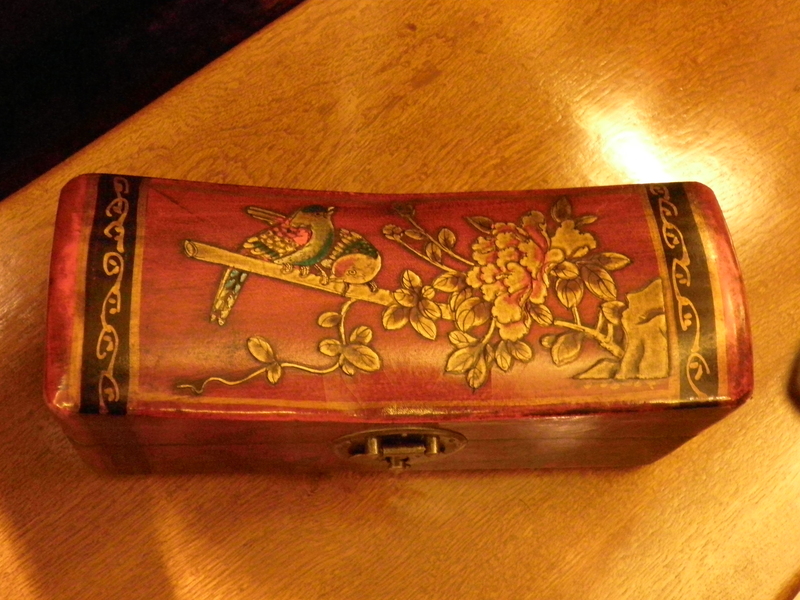 However, this innocuous seeming wooden box put up a brave fight for my attention. 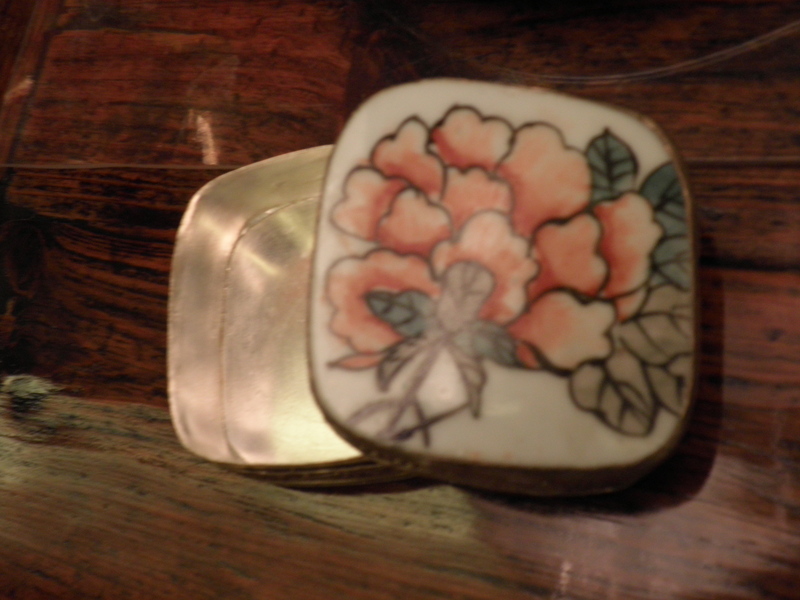 It looks perfectly harmless on the outside, with a very cute oriental inspired floral motif with birds. But you only have to open it to discover its surprisingly naughty alter-ego. 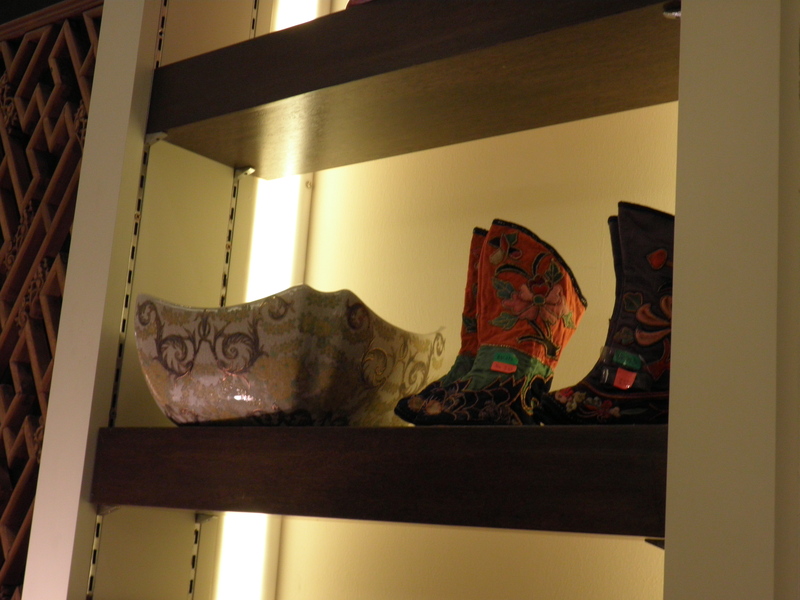 Dainty boots for bound feet. Ouch. And lastly, objects of great thematic significance on this blog. 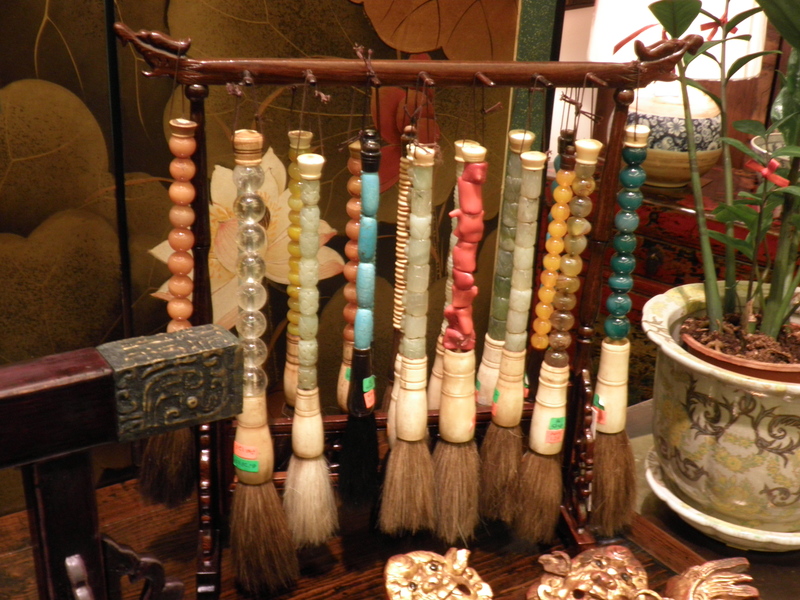 Calligraphy brushes! I think the handles are made of semi-precious gemstones. How’s that for a dash of arty bling? Overall, this place was quite the find. It was like sifting through a very well-organized Empress Dowager’s attic, which I don’t have to tell you is an experience. I really love outlets like this that set themselves apart from the manufactured mall culture plaguing my country; they have so much more to offer and enrich the senses with. I hope that this undercurrent of connoisseurship will continue to develop as Malaysian wallets get fatter. Viva subculture! Also, I now have to change the name of this blog too. It’ll now be the Seasonal Calligrapher because there is a website called http://www.dailycalligraphy.com/. And I think I’m too young to be harassed by copyright…. Also, seasonal sounds a little less Newsweek, a little more poetic, no? …or with just anyone, for that matter. My emotional reaction to this final episode of the Pixar franchise was unpredictable, alarmingly instantaneous and impossible to contain. What I mean by this is, I came very close to tears. While as the plot is as novel and kid-friendly as you’d expect, it is one that is undoubtedly familiar and relatable to everyone, particularly those who have just recently left for college. It’s all about letting go of your childhood. 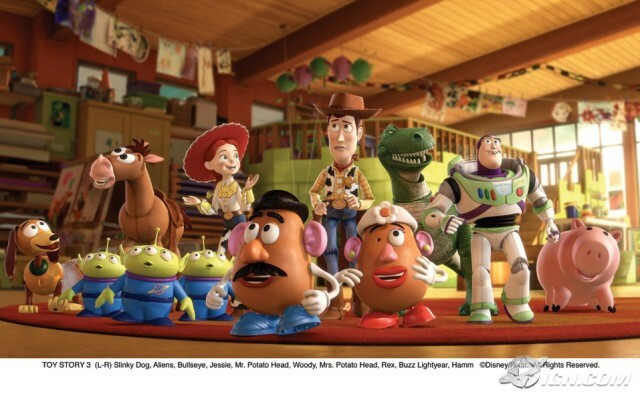 Andy, Woody’s owner, is just about to leave for college and has to sort out which of his toys gets given away, stored in the attic or brought with him to college. Because Andy is now too old to play with them, they are convinced that they have lost their meaning to him and dread his final verdict. I guess it just struck me how toys are really like old friends. Without their constant companionship, we feel like we haven’t really experienced childhood. And then, we outgrow them and get on with life. But when we really have to leave them behind, like Andy does here, we suddenly realize, this is it. This is goodbye. It’s just such a symbolic part from our fantasies and dreams, our crazy notions that we could fly, become astronauts, conquer the world. I’m pretty sure I’m not the only one…. right? Of course, I could also go on for ages about how the Toy Story gang is just as charming as ever, their ingenious escape plans, the awesome new characters. But this is what stayed with me, I guess. I still feel all sentimental and mopey writing this, actually. So, I will never watch this on a first date or with anyone I don’t know too well. They might mistake me for the maudlin type. And then take me to see the newest Nicholas Sparks movie adaptation the next time round. Ugh. Summer and FIFA have officially made it to my list of deadly habits. Lie-ins, obscenely long lunches (sorry for the alliteration), pointless trips to the mall, hours on the PS3 screaming at imaginary people, hours in front of the tv screaming at real people. I could probably go on forever. Productivity has been a bit of an uphill battle. Just to give everyone an idea of how bad it’s been, I feel accomplished just for finishing this paragraph. What I’m gonna post today may come as a bit of a surprise………… wait for it………… schoolwork! Don’t get me wrong, I do not get any adrenaline rush whatsoever from papers, assignments, classes. In fact, I generally pretend they don’t exist as long as I can get away with it. That is, when the deadlines leap out at me from dark corners and practically smack me in the face. So why do I, model layabout of the century, include them in a blog that is supposed to be entirely about what I love? Simply because these particular papers have somehow proved to be much more than tedious interruptions to my peace of mind. In some cases, the topics are too original to ignore, too brilliant not to care about. In others, the results of having finished these papers were well worth my aggravation and the hours I could have spent wasting time. I will only post one today. It was done for a Shakespeare class two semesters ago. I’d been fairly intimidated at the prospect of having this particular professor review even a word I’d written. She was a British stereotype, in a very good way, of course She was acerbic, witty, extremely intelligent, dignified and gave off the distinct impression that she did not suffer fools gladly. When I finally got round to reading the paper topics, I was astonished at how differently she operated from other professors I’d had. The very first prompt was to write a monologue, from the point of view of a submissive female character in one of the tragedies! I was both psyched and terribly afraid she’d hate whatever I came up with. driven mad by his nasty, incredibly unfair treatment of her and her father’s murder at his hands. I’d been irritated with her in the play because all she did was wring her hands and cry whenever he was behaving like a sexist pig to her. When she eventually becomes insane, she gets a little more interesting. She speaks in riddles and brings symbolic flowers into the throne room, more than hinting that she is aware of Claudius’ machinations. Here, I transformed her supposed madness into anger. She is controlled, but utterly furious at the wretchedness of her situation, at Hamlet’s behaviour, at everyone for not taking her seriously. I just felt that anger made her more forceful and multi-faceted than she would be otherwise. To my immense surprise and satisfaction, my professor thought so too! It might be a little hard to get into at first; after all, I did have to make my soliloquy seem like Shakespeare wrote it. But not to fear, most of it is composed of an explanation that will (hopefully) clarify my intentions behind it. Without further ado, enjoy! The soliloquy takes place in an imagined setting just after Ophelia has just confounded the court with her cryptic songs. Symbolically enough, she is sitting beneath the willow tree from which she will fall to her watery death and picking the flowers she will immediately present to the court and her brother (4.5.173-182). I chose this particular point in the storyline to intervene with Ophelia’s point of view because she is at her most intriguing and yet also most incomplete when she is mad. She is simultaneously uninhibited and crafty, interspersing innocent melodies with subtle hints that she knows more than she lets on. I have depicted her madness as a liberating mechanism rather than a mental condition, unleashing a Pandora’s box of forbidden ideas and sentiments that would make a maiden blush, were she in her right mind. But first, there are always the technical issues. Ophelia, from what we had previously seen of her, had a personality that could basically have been summed up in a single phrase she utters to her father: “I shall obey, my lord” (1.4.136). There was going to be a glaring discrepancy between the way I wished to present her and what we saw of her in the play. While I wanted her forcefully emotional and bitter inside, the worst she could come up with when Hamlet assaults her virtue by telling her that he “…could interpret between you and your love if I could see the puppets dallying” was “You are keen, my lord, you are keen” (3.2.225-227). Adding new dimension to Ophelia was crucial in an in-depth character exposé like the soliloquy but challenging with such an incredibly limited characterization to work from. The other complication was her madness. I could not help comparing my depiction of her in this state to taking a inebriated friend home to meet my parents. It simply felt like I was presenting this heightened thoroughly unreal version of her under the influence of an external force rather than providing an unadulterated portrait of a little understood character. In order to pull off replacing her staid disposition with my own characterization, I adopted a compensation tactic. 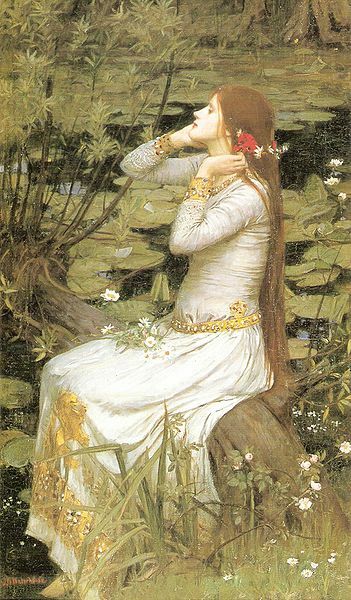 Ophelia serves a highly decorative function in the play, which I have played up to startling effect. Her madness has an aesthetic quality to it, replete with flowers and songs. Even her death, a morbid event in and of itself, is beautiful and imprints strongly in the mind like picture perfect iconography in a Renaissance painting. (3.4.67-68).. Laertes adopts an all-knowing self-righteous tone when he tells his sister “The chariest maid is prodigal enough/ If she unmask her beauty to the moon” (1.3.36-37). The men in both their lives assume the right to tell them what they are and what they should be, expecting them to submit to their subordinate roles as “nature” would dictate. Because of her feeling of kinship with the queen in this respect, Ophelia conjoins them as a single unit towards the end, rewriting the conflict of her interior drama as one against a patriarchal standpoint rather than one opposed to the rot at the heart of Denmark. I have heard of your paintings, too, well enough. God hath given you one face, and you make yourselves another. You jig, you amble, and you lisp, and nickname God’s creatures, and make your wantonness your ignorance. Go to, I’ll no more on’t. My Ophelia has been painfully awakened to the fact that all her training on ladylike, attractive behavior had really done was earn her his contempt. Nothing she does, whether she behaves as is fitting for her “station” or speaks her mind, seems to satisfy. Her heart is not merely broken here, it is as bitter as gall. This is quite evident in her mocking echo of him telling her to “get thee to a nunnery” as bit of petty revenge on her part (3.1.122). She is wholly cognizant of the fact that her father is dead and that her brother is coming back and will find out soon. Her gift of the flowers too raises questions about her supposed insanity; she very deliberately gives Gertrude and Claudius “fennel for you, and columbines”, each respectively symbolizing flattery and infidelity (4.5.177). My version of Ophelia is not so much mad as drunk on her sorrows, which brings me back to the analogy of the inebriated friend. Just like an intoxicated person, she is not truly behaving like herself but is instead revealing facets of herself that previously lay dormant beneath her mask of good breeding and ladylike restraint. Her accumulation of misfortunes, particularly the loss of her father, have now thrown her into an abyss from which she knows no means of escape. My soliloquy finds her stumbling to grasp some form of agency and a sense of meaning in her tragic situation when everything is spiraling out of control. She feebly tries to alleviate her stifled mental state by doing her own form of emotional unfolding in the only way she knows how: indirectly. Thanks to a lifetime of being seen but not heard and to her own natural docility, she is ill equipped to freely voice her thoughts. Thus, even her most stringent feelings are severely watered down when outwardly manifested, appearing instead as cryptic messages scattered throughout sweet smelling bouquets and melodic lays. My soliloquy, I believe, is a plausible inclusion to Act 4.5 because it supplies the reader with Ophelia’s unedited viewpoint without changing any detail in the original plot. Also, it gives an idea of the thought processes that had likely led to her eventual suicide. Most of all, it provides Ophelia with the sympathetic audience she so needed to preserve her own sanity of mind. She does not die as another forgettable victim of the chaos plaguing the Danish court; we can now see her as a rounded character who is perhaps even as complex as Hamlet.